In my previous post, I wrote about the features of methylKit. Here, I will discuss how to extend bisulfite sequencing data analysis beyond methylKit. Annotation is an important feature of genomic analyses. Coming to bisulfite sequencing analyses such as RRBS or WGBS, methylKit does a pretty good job by identifying the differentially methylated individual CpGs or any specific regions/tiles. It also performs basic annotation and plots pie charts indicating where all the differentially methylated CpGs overlap the genic annotations. 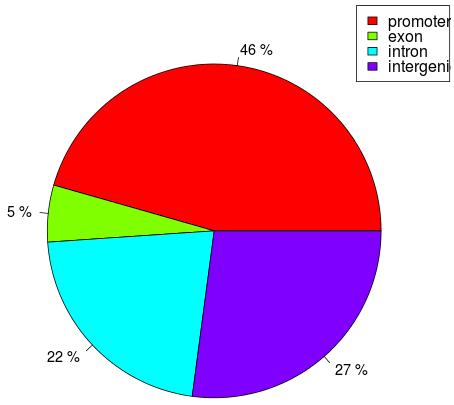 CpGs 46% overlap with promoters, 27% overlap with intergenic region. Another way to look at the annotations is to identify the list of promoters, exons, introns, intergenic regions that overlap differentially methylated CpGs. There are no methylKit functions to perform the annotations from the point of genic regions.However, methylKit facilitates this by enabling the coercion of the methylKit objects into "GRanges" (GenomicRanges). The following script will help methylKit users in extracting the list of promoter/exons/introns that overlap with differentially methylated CpGs.